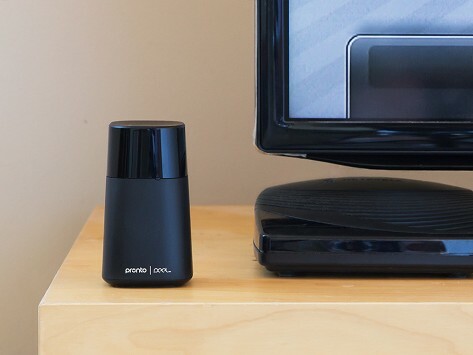 Pronto is an infrared (”IR”), transmitter that turns your iPhone or iPad into a universal remote. It works with components like your cable box, DVD player, Apple TV, gaming systems and more. Through the free Peel app, you can access streaming accounts, like Netflix and Hulu, control up to eight devices per room, browse listings by image, and create custom actions—no remotes required. Dimensions: 2" x 2" x 3.6"
I bought this for my husband as a widget. It is the best thing ever. We are able to control our tv from his Iphone and we didn't have to put another cable box in our bed room. It works with all devices except that the multi function is very confusing and I have not been able to get it to work. Clear out the controller clutter and manage your in-home entertainment with one streamlined app.